This session is a roller coaster of intensity– a symphony of contrasting flavors, colors and feelings. 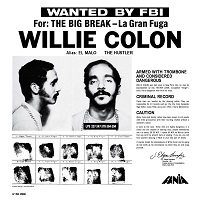 Perhaps the one moment that best encapsulates the transcendental qualities of this collection is the bridge of “Panameña”– the moment when the tune stops on its tracks, Lavoé introduces la salsa de Puerto Rico, el aguinaldo (Puerto Rico’s own salsa, the aguinaldo) and all hell breaks loose thanks to Colón’s roaring trombone and the spidery piano lines courtesy of the maestro Profesor Joe Torres. The resulting effect is nothing less of apocalyptic. to create a realistic looking poster. After its release, the company was contacted by the real FBI, which requested that the ‘Wanted by FBI’ text be removed from the cover. Listening to these eight, timeless tracks decades after their original release, the music compels you to ask: how could two young men in their ’20 have so much to say? How did they manage to record an album of such depth and beauty? It may be advisable to stop pondering such heady issues and enjoy the music instead.